Memorial Day is a day to remember the sacrifices of those wh0 have paid freedom’s price. I hope you pause sometime over this 3 day weekend to remember the hardships, the heartaches, and the acts of heroism that have sustained the liberties we enjoy. Very few of us are enough of a history buff to connect the last days of the month of May to the evacuation of Dunkirk in 1940. I would encourage you to read this link that provides an interesting account of the pivotal events that transpired on these historic dates. While World War II might predate many of us, the events of 911 are etched in the memories of more than just a few who will read this blog. I was sent a link to a YouTube video a couple of months ago, and the events of this video made me think of Dunkirk. I encourage you to watch this goosebump-producing video by clicking here. Both the article and the video I shared are a testimony to the power of the human spirit. I hope the sacrifices of Dunkirk in 1940 and the heroes of 911 are enough to keep you thinking and remembering. There are times when the burdens of life are incredibly heavy. When I experience these times in my personal life and when I walk with others who are struggling, Hebrews 12:1-3 is the Gatorade that keeps me going: let us run with endurance the race that is set before us. Heartache, sickness, and grief can present circumstances that are difficult to endure. 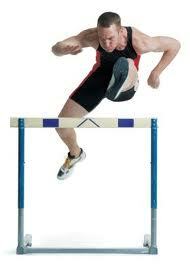 Like it or not, they are hurdles that are a part of life’s race. Regardless of how hard we train, we will find it difficult to cross the finish line if we do not keep our eyes on the goal. The key to finishing the race is to keep your eyes focused on the next step and not the hurdle three steps in front of you. Even though tragedies and trials can appear to be insurrmountable obstacles, a person needs to see more than just the mountain ahead? Instead of yielding to the mountain, focus your faith on the God who made the mountain. When troubles come, do you see just the storm or do you see the rainbow? When you feel there is no way out, do you hear the roaring lion or do you feel the presence of Daniel’s angels? When it comes to endurance, you do not have to walk alone. Jesus extends an invitation to walk with Him and He offers to help carry the load: Are you tired? Worn out? Burned out on religion? Come to me. Get away with me and you’ll recover your life. I’ll show you how to take a real rest. Walk with me and work with me—watch how I do it. Learn the unforced rhythms of grace. I won’t lay anything heavy or ill-fitting on you. Keep company with me and you’ll learn to live freely and lightly (Mattew 11:28-30 The Message). Like many people, Psalm 23 is a favorite of mine. As I was reading it earlier today, the last four words of verse 3 caught my attention: The Lord is my shepherd; I shall not want. 2 He makes me to lie down in green pastures; He leads me beside the still waters. 3 He restores my soul; He leads me in the paths of righteousness for His name’s sake. The personal application for us is that when we are struggling with emotional or physical issues, we can call out to Jevovah-rophe. When we feel like we are alone and no one cares, Jehovah-raah is present. When we do not know where to turn or what to do, Jehovah-jireh will provide. When the world seems to be shattered and crumbling beneath our feet, Jehovah-shalom is the peace in the eye of the storm. I hope his name’s sake will be enough to keep you thinking. I find the language of the media and politicians to be interesting. They carefully select a specific word or phrase and use it like an artist to paint a glowing picture of either the issue or the the person they are promoting. I recently read an article that praised an individual for the wonderful way his position had “evolved.” Later in the article the writer lambasted another person for “flip-flopping.” Correct me if I’m wrong, but I think both of the individuals in the article had simply changed their minds on an issue. My concern is not so much about how we evolve or flip-flop, but more on what we become. The teaching of Paul is clear on this matter. In Colossians chapter 3, Paul lists the necessary steps we are to take, so we can become more like Christ. I encourage to get your bible out and read this passage of Scripture or click here to read it. There is more than one thought in this passage too keep yoou thinking. I heard my cell phone start talking to me about 4:40 this morning. When it is on the charger and there is a power interruption, it emits a series of quick beeps. I’m an early riser anyway and once I’m awake I rarely go back to sleep. I gathered my clothes and went to the kitchen for my first cup of coffee, and . . . that’s right—no electricity—no coffee. As I sit in the dark and write I am in a state of forced solitude. I have used my cell phone to read a devotional, and I have offered up a prayer. I have also come to a conclusion: I am ill-prepared for a life without my expected conveniences. No electricity means no internet, no TV, and woe is me—NO COFFEE! At least my laptop has a good charge. The truth is, solitude is what is lacking in most of our lives. This quiet environment should be the rule of life instead of the exception that is forced upon us by Mother Nature.